Just like previous versions, you can boot Kaspersky Rescue Disk 2018 ISO from Grub2 and Grub4dos. It supports booting in both UEFI and Legacy modes. What is Kaspersky Rescue Disk? As the name implies, this is a rescue disk released by Kaspersky. It is a Linux based operating system, its previous version is based on Gentoo and the 2018 version is based on SystemRescueCd. Just like the Linux and WinPE operating systems, you can use the built-in tools to diagnose and rescue your computer. 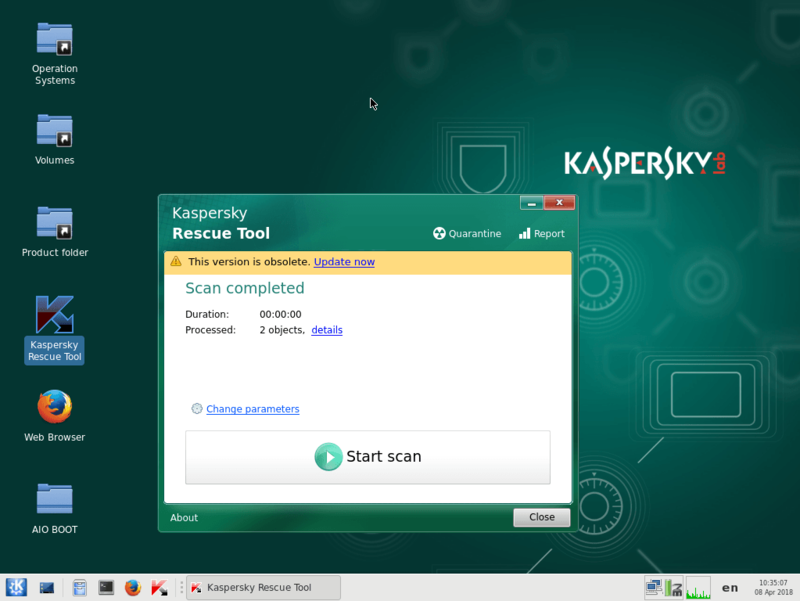 I used Kaspersky Rescue Disk 10 before, everything works fine. At version 2018, it supports booting in UEFI mode, but I have encountered a major problem. I have access to all the partitions, but there are not any partitions in the list so I can select and scan. I have tested and this problem does not happen on the virtual machine. Update: I have updated to the latest version and it looks like everything works. There are many manufacturers of antivirus software also have their own rescue disk, see the list of packages supported by AIO Boot. I personally encourage you to use these packages. When you suspect the current operating system is infected, simply shutdown, plug in and boot USB to scan. AIO Boot now supports integration for both versions, just run AIOCreator.exe to integrate. Here I will guide you to boot Kaspersky Rescue Disk 2018 from Grub2 and Grub4dos using ISO file. You can also extract ISO files to any folder you want. Download Kaspersky Rescue Disk 2018 here. If you already have Grub2 or Grub4dos installed on your computer, you can add the Grub2 menu directly without having to create a USB boot. Copy the ISO file of Kaspersky Rescue Disk 2018 (krd.iso) to /data/krd.iso. 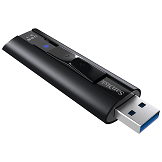 You can put this data directory on any drive. You can also extract the ISO file to whatever path you want. Here I will extract the KasperskyRescueDisk2018 folder on the root of the drive. Then add the menu. Kaspersky Rescue Disk 2018 is based on SystemRescueCd, which has a very nice feature that is backing-store. It allows you to save changes including browser data to somewhere that it supports. For Ubuntu it is called persistent mode. But there is a big problem that has arisen when I use this feature, that is, I can not update Kaspersky’s virus database. Currently they do not support this feature, but may in the future. If you want to try this feature, simply add the parameter backstore=alldev,data.img to the linux command (or kernel). Then copy the data.img file (EXT3 format) into the data directory. The data.img file can be found in the \AIO\Tools\DATA.IMG directory of AIO Boot. I tried to boot Kaspersky Rescue Disk 2018 via iPXE but failed. Antivirus programs can define new viruses by updating the database without updating the program. Virus definitions can be easily updated through its program, but it requires an Internet connection. 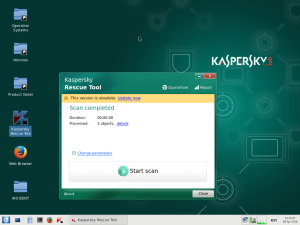 Kaspersky Rescue Disk is an operating system that can run on USB and CD/DVD… And you can boot it on many other computers. Virus definitions in the ISO file you downloaded may be out of date. When you start the program, thanks to a network connection it can update the new definitions. But it does not update the file that it previously used, it will save the definition to the KRD2018_Data folder for future use. But if you boot it on a new computer that you have not updated or updated the latest database before. You need to update it again, or you will not be able to update if you do not have an Internet connection. I tried copying the KRD2018_Data folder to the USB drive but it did not work for me. We will update the definitions manually for Kaspersky Rescue Disk 2018 by replacing its latest 005-bases.srm file. For AIO Boot users, you can find the data directory after the integration at /AIO/Files/Antivirus/krd/data. Download the 042-freshbases.srm file, rename it to 005-bases.srm and copy it to the /data/005-bases.srm path. Download the hashes.txt file, rename it to 005-bases.srm.sha512, and overwrite it with the /data/005-bases.srm.sha512 path. This is the file containing the hash of the file above, you can compare these two hashes, if different means that you are using the old version and should update. You now have the most up-to-date virus database. Do not forget to manually update to make sure you always use the latest version even on offline computers. You can update and repackage ISO files using mkisofs and xorriso to burn to CDs and DVDs, but the database will soon be outdated. You should attach ISOs to VirtualBox and VMware and test to make sure everything works well before burning. Will you release articles like this for more of the supported packages? I have configured a grub-multiboot-usb myself, but it is hard to find working grub2 entries for various .iso files. I would be very grateful for a more complete list of grub2 entries, both booting directly (prefered) and extracted. I downloaded the tool to see if it comes bundled with this information, but it seems like for kaspersky, only an entry for the “extraction method” is available. If there is a place to find this information that I am not aware of, I would appreciate if you could point me there. You can get the menu code in /AIO/grub/menuoff. I have found that on github, thanks! I noticed that kaspersky for example only has an entry for extracted iso. In this article there you also show an alternative entry for “Boot directly from ISO file”. So I was wondering if there was a more complete list. Hi any chance you could look at the latest Bitdefender Rescue CD as this doesn’t appear to work with the AIO Boot integration tool – well it doesn’t appear to work where the USB drive has been formated with fat32+ntfs. Not sure on fat32 alone but will be checking now. I think the Kaspersky and Bitdefender CDs are usung different linux formats/boot methods but not sure. Select the Change root partition menu, then select the FAT32 partition, you will see the menus that you have integrated on it. Now you can manually update bases from 042-freshbases.srm file without extract all data from ISO. 1. Need to place krd.iso and 042-freshbases.srm, 042-freshbases.srm.sha512 to data/ dir. Yes, I use the ISO extract method and replace the 005-bases.srm file. Some computers will not be able to boot from the ISO of the Linux distributions, it needs to extract. I don’t like to edit anything manually, I just like to add things automatically, so what now? use version 10 till you figure out how to add version 2018 automatically also it’s important to have Kaspersky’s virus database updated, not all systems could be connected to the Internet. The next version will support the 2018 version. Same issue with E2B booting as ISO. It cannot see the internal SATA hard disk!